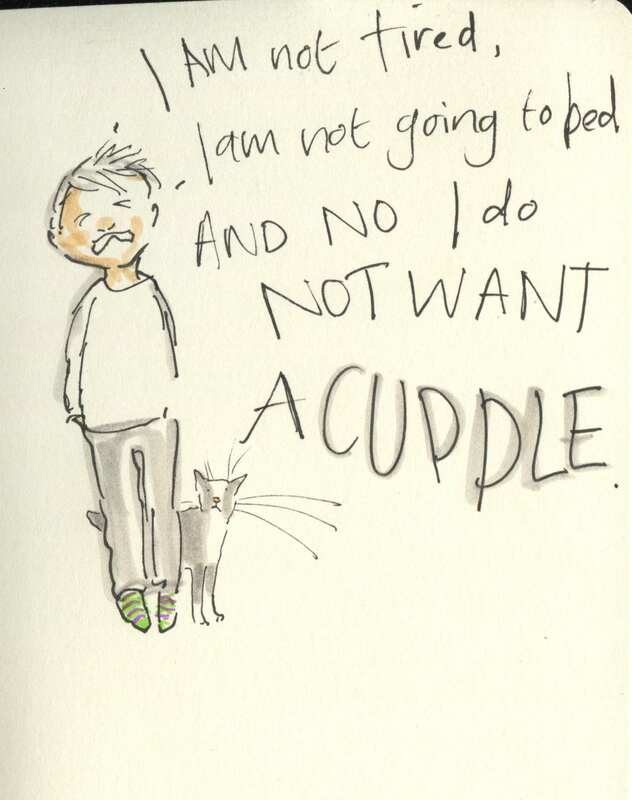 Posted on July 7, 2015, in Uncategorized and tagged Children, Doodlemum, Drawing, Humour, Illustration, Sketchbook, Strops. Bookmark the permalink. 13 Comments. Wish I had a dollar for every time this was enacted in my house. So our house at the moment! bang on the money. This is so our house at the moment! bang on the money. For some reason this picture inspires to tell you how much I love your “doodles.” It’s a straw that broke the camel’s back moment, just now, because I love all of them. Ignore him, let him stay up, if he falls asleep on a chair leave him there all night, and don’t give him ANY cuddles until he comes and begs for one. He’ll get the message. He’s growing up so fast…..
I’m tired, I’ll go to bed, and please may I have a cuddle? !